We've seen this plot before. Or have we? The story: A young man (Ben Youcef) immigrates to the United States from Algeria, travelling from New York to Los Angeles and assimilating into American culture. However, he harbors a dark secret, and is involved in a terror plot that could claim the lives of thousands in this thriller. We've seen this plot before. Or have we? Like the first season of "Homeland," "The Algerian" is about terrorism on the surface, but the message is a broader one in light of ISIS, Iraq and Charleston: embracing others who are different, co-existence, acceptance, friendship beyond backgrounds. The cast is diverse, with three lead African American actors, including Harry Lennix (The Blacklist, Matrix Revolutions, State of Play, and Man of Steel.). In this film, Ali, the protagonist played by Youcef, arrives in Los Angeles with a plan to detonate a nuclear bomb his extremist group has attained. He has a hardened heart and an iron will, made clear by his workouts each and every day. But something happens. 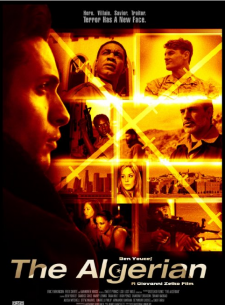 Ali comes into contact for the first time with those who have been stereotyped to him, an American soldier named Patrick (Josh Pence), a young African-American woman who has had to be unchaste to survive (Candice Coke), a Jewish co-ed (Tara Holt) at the university where he is studying and a peaceful Imam, played by Lennix. Ali learns that people are not so different, each with their own struggles and passions not so different from his, not just cardboard cut-outs as they had been to him before. It is at this point this international political thriller takes off, right up to the final heart-pounding moments when you wonder, will he, or won't he? The movie has already been a hit on the film festival circuit, as an official selection for the Montreal World Film Festival, The New York City SOHO International Film Festival and New York City Independent Film Festival, with numerous awards such as Best Picture, Best Actor and Best Cinematography (Los Angeles Downtown Film Festival), Best Thriller (The Northeast Film Festival) and Best Feature Film and Audience Choice Award (New Orleans Big Easy International Film Festival). It was also a hit with me, not only because it kept me guessing the entire time, and the level of performance. But also because we need more films with this message. To remind people that behind all the propaganda, ruthless agendas and simple hate, we are all people, sharing 99.9 percent of our DNA. We need to find ways to come together and get past ancient hatreds and superstitious beliefs. That includes right here in the United States, in places such as Ferguson, Missouri. The film goes into limited release this weekend, playing at The Regal Majestic Stadium 20 in Silver Spring, Maryland. The premiere is Friday night at 7:05 pm. with showings throughout the weekend & week. Tickets available here.